Oh that would come in handy. I can think of several occasions in the last week... What made me laugh out loud? The bozo screaming "Free Bird" every 5 seconds. Did you move into my neighborhood while I wasn't looking??? Oh, I hate ALL of those things..... I'd rather stay home and watch "Austin City Limits." Ahhh...the mix of people at concerts and shows. It's part of the experience I suppose, the part that drives you crazy. I went to a Carolina Panthers pregame tailgate party near the stadium. Down the hill was a line of folks and at the head of the line was 10 portajohns. After avoiding it for as long as I could I eventually had to go. I am lucky I could stand and I still felt violated. Those things needed to go to Yucca Mountain. The tired cop working security in the hot sun might use that as well--nothing like being locked in a port-a-potty by an annoyed officer. A Pit Stop It! Awesome. I know some people who could use them. That is funny! I hate portajohns! 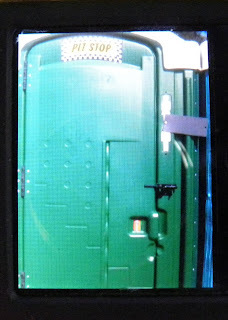 My MIL went to the Port-O-Pot during a local car show. She forgot to lock the door because she is an idiot/blonde/hippie/whatever. Some big burly biker open the door on her as she was standing with pants around her knees. She covered only her face. And she screamed while running in place. The biker, frightened by the site of this crazy anonymous bush monster, quickly shut the door back. I should also mention there are about 250K people that attend this car show. So there was a crowd in front of the johns that witnessed this. I have to own up to something... I love port-a-johns. I have found some of them at the end of a very long walk to be God sent blessings and have experienced no greater bladder relief than in one. So... Freebird.. who's better, Lynyrd Skynyrd or Wynonna Judd? I found you through Fragrant Liar and I'm glad I did. Having lived a long and happy life by avoiding Porta-Cans, I had no choice but to visit one last year. While hovering and trying not to LOOK DOWNWARD, I saw cute little bars of soap, stacked in an alcove at my hovering eye level. As I exited, I picked up a bar and wiped my hands, producing no lather but a fragrant aroma. While telling my husband of the special bars of soap and letting him smell my hands, he said: "Honey, honey, honey....those were URINAL CAKES" Yes. I'm THAT naieve. Sounds delightful. I guess I need to attend more of these. haha that is too funny. I guess you need the buddy system for that one so someone can make sure you don't get locked in... but you have to really trust your friends, haha. I will do anything before I enter a Port-UH Oh-Potty. I can't stand them. Give me a cup and something to hide behind if I'm that in need. Hmmm, I can think of a few times when I could be the one locked in there. I love how you also have a friend that says "This is MY SONG" before every single song....how many songs do you have????? Seriously. That is too funny! I wouldn't want to be the person that didn't realize the lock was on the outside!! Ok I admit that sometimes I take up two parking spaces too...but in my defense I wouldnt do it if there was limited parking. Usually I do it at the grocery store because my truck doors open suicide style in the back and I have to open the doors ALL the way in order to get my kids and groceries in! You'd die from the fumes locked in that thing! hehe...i can think of a few people...smiles. Free Bird - high school flashbacks. Recently I had to sprint with booboolala about 1/2 mile across a park at a lake to the nearest port-o-potty and then there was NO TP. UGH> and it was about 90 degrees out so you know. Fun. You just summed up why I don't go to any palooza-ish festivals anymore. I'm afraid I'm that girl that claims every song. I mean, what can I say? I just relate to them all. This is the very reason to buy CDs...and a 100 CD changer. I love mine! I have used more "honey Buckets" than any grown woman should have too. That's all that's available come race days. I would like this one on each course from now on, so I might have some chance of placing. I could just lock a faster runner in there. I have to be fairly desperate to use a port-a-potty, even with the lock on the right side of the door. I have never been to an outdoor concert....I get a little claustraphobic. and I HATE port-o-potties. YES INDEEDY, I hover. and I make someone stand outside to "protect me" while I am in there. Hey, I could lock my kiddos in there! But, wait, would have to sanitize it completely first. But was this for real? I mean, you really saw this thing? w/ the lock on the outside? wtf? Oh too funny! My husband and I had experience with some of those people when were were at Chastain of all places a few weeks ago!